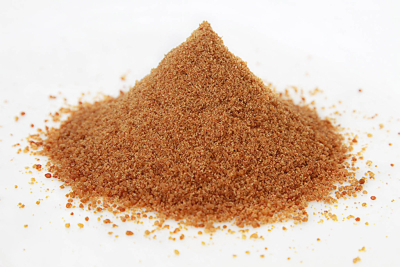 Item #0663: Organic Evaporated Coconut Palm Sugar is cultivated from the Indonesian island of Java. It is derived from the sweet nectar of the sugar blossoms that grow at the top of the tropical coconut palm tree (Cocos Nucifera). Traditional local farmers climb high into the canopy of swaying coconut trees and harvest this sweet nectar by gently slicing open the flower. This nectar is then converted into its traditional crystalline form in traditional sugarhouses that allow for small batch Palm Sugar production. Our Palm Sugar is naturally comparitively low on the Glycemic Index (GI), rated as GI 35. In comparison, most honey is GI 55 and Cane Sugar is GI 68. Palm Sugar has been known to deliver a slow release of energy, which sustains the human body through your daily activities without experiencing the "highs" and "lows" so often associated with cane sugar. Palm Sugar also has a nutritional content far richer than any other commercially available sweeteners. It is particularly high in Potassium, Magnesium, Zinc and Iron. It is also a natural source of vitamins B1, B2, B3, B6 and C.
Palm Sugar can be used as a replacement to cane sugar in most applications. It has a very low melt temperature, a tremendously high burn temperature, and it dissolves in water, making it extremely versatile. It is perfect as a sweetener in smoothies, shakes, spreads, cereals, energy bars, and deserts of all kinds. Palm sugar is also the perfect complement to all of cacao products for both nutrition and taste. Ingredients: 100% raw, organic, coconut palm sugar. NO additives, fillers, etc.